While looking through homes for sale today for a client of mine, I came across this photo that is actually listed with the home. 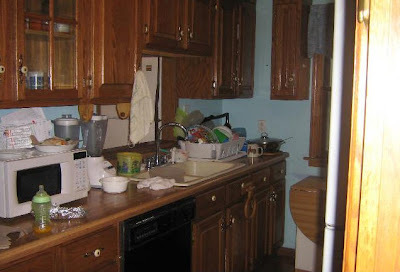 If you are a seller : don’t you dare let your home look like this when a Realtor comes by to photograph your home. It will NEVER get showings. If you are the agent: don’t you ever take a photo like this and post it with the listing. You are shooting yourself in the foot, along with the seller. Please take the time to move the items off the counter and then take a GOOD photo! HAHA this did make me laugh though because of its honesty. The baby bottles say it all. Yes, I can understand that cleaning the kitchen might not be a priority for a family with an infant. In these cases, the agent should really step up and kindly ask if he/she could move a few items for the photo. More than on one occasion I have moved items out of camera shot to get a good picture. Sellers still have to live their lives.